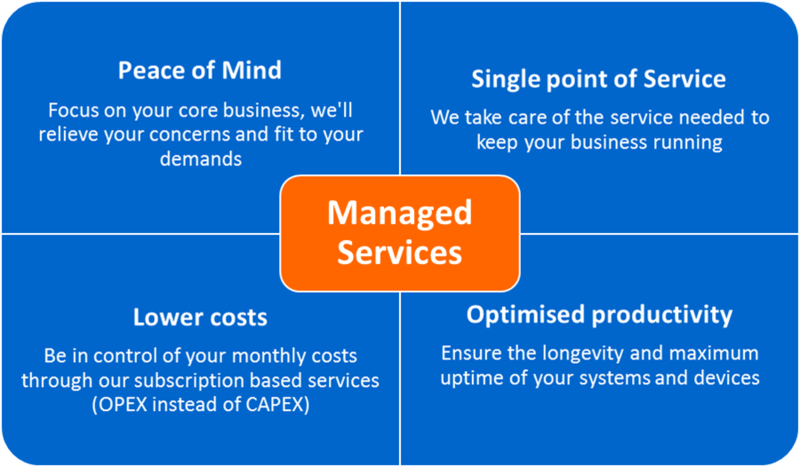 GetTeck delivers IT Managed services as your business grows. This allows your business the flexibility to start with managed IT services that make the most sense for your organization, and then expand with us as your needs grow. Many executives who are responsible for their business IT prefer to have GetTeck take the responsibility of IT off of their hands. GetTeck will manage their IT resources on site or in our data centers as well as oversee the entire IT infrastructure, including desktops, servers, networks and more. Frequently IT management is referred to as the black hole of the back office. It can be a tremendous drain on resources, money, and time—all of which is in short supply. Business executives responsible for IT are looking for a qualified partner like GetTeck to take the lead in IT - saving money, time and other valuable resources. That’s why GetTeck offers Complete IT Management. With Complete IT Management, we manage, maintain and support your entire IT infrastructure for single monthly fee, whether your equipment is at your location or onsite at our data centers. We are here to serve you and your needs with services ranging from full hosting to a hybrid approach where we will host a portion of your servers / equipment in our data centers while we manage other equipment at your location. Many IT services included in Complete IT Management pan are available a la carte. We will work closely with you to ensure that your specific IT needs are met. Look to GetTeck for a variety of managed IT services including data center services, cloud services and professional services. Complete functional devices, out of the box: We provide for the complete physical preparation for the hardware and software commissioning of your devices to provide you with equipment that is ready to use on Day One. Device Management: We manage your equipment (firmware, patches, software, drivers and security protocols) remotely and keep it up to date. Asset Management: Maintain full visibility of all your devices with GetTeck's central device management software. Tier 1, 2 and 3 support desk: Our technical support team will address your IT needs and resolve your incidents using ITIL-based methodologies. Remote Management: We manage the entirety of your infrastructure and actively report on issue status and solutions. On-Site service: Your on-site equipment will be quickly repaired and managed. Service Management: Look to GetTeck to provide you with the best in service. The same technicians supporting your hosted equipment here in our offices are available to assist you with your on-site equipment. GetTeck is here to serve you.